Hollywood’s IT girl of the moment is Christina Hendricks, the voluptuous redhead who plays über-secretary Joan Harris on AMC’s MAD MEN. Hendricks (for those of you not paying attention) is a throwback to an era of Jayne Mansfield and Russ Meyer, the antithesis of the Size 0 pretzel sticks dominating the tube and screen. But with Hendricks in the running for Esquire’s Sexiest Woman Alive, could she signal a new standard of beauty in Hollywood? This is not to say that Christina Hendricks isn’t hot. Oh, she most undoubtedly is. But part of the allure of the actress lies in the character she plays on TV. Joan is, despite the circumstances of sexism and paternalism in the 1960s, a strong woman, smarter than the men who think they’re dominating her. Joan carries a steely resolve as she suffers the slings and arrows of a society that underestimates her as a servant or mere eye candy, or, in the case of her ineffectual husband, a piece of property. All the while, she embraces her sexuality, and not just because it’s a powerful weapon in her arsenal. Joan is a sexual being, and she’s comfortable with it, which is enticing to both men and women. To varying degrees, we can’t help but attach personality characteristics onto actors of the parts they play. But it doesn’t seem to be too much of a stretch to think that Christina Hendricks is as comfortable in her skin as Joan. She’s certainly not a celebrity to demand Photoshop liposuction in her magazine spreads. Beauty is subjective, of course, and some people prefer thin. But surely I’m not the only person who finds the diminutive Alexis Dziena (Eric’s annoying love interest on ENTOURAGE last season) being presented as a bikini-clad sexpot in the execrable FOOL'S GOLD to be more than a little disturbing. Her tiny, rail thin body looks, well, more like that of a child than a woman in her mid-20s. But in Hollywood, Dziena is the rule, not the exception. Hendricks is the latest Hollywood anomaly of the “big girl” who steals the thunder from the parade of starlets whose bodies barely seem substantial enough to hold the weight of their heads (I hearby coin the term, “Hollipops” for these walking candy sticks, feel free to propagate at will). But the fact remains that film and TV is dominated by actresses like Kate Bosworth, Olivia Wilde, Keira Knightley, The Olsen Twins (do they count as actresses? ), Katie Holmes, Lara Flynn Boyle, anyone on 90210, Rachel Bilson, Rachel McAdams, Sienna Miller, Jessica Alba, Thandie Newton… the list goes on and on, as it has for decades. There’s even a sizeable sorority of formerly voluptuous actresses who have since caved (literally and figuratively) to the teensy weensy standard ala Jennifer Connelly, Angelina Jolie, Christina Ricci, Renee Zellweger and Lindsay Lohan, just to name a few. 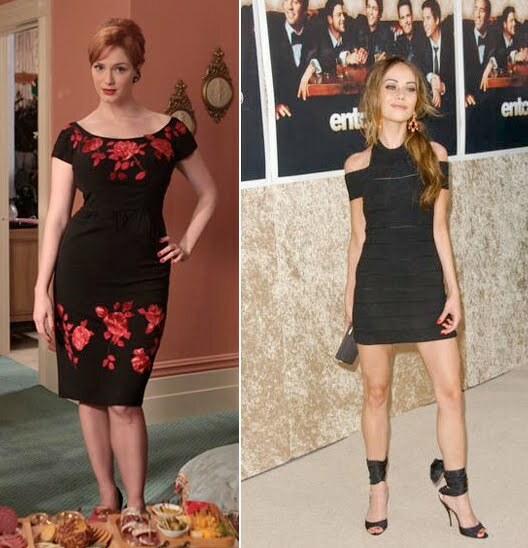 The point is, don’t believe it when people herald the ascendancy of Miss Hendricks as the dawning of a more enlightened age of realistic body types in the movies and TV. After all, most articles about Christina have to go back a half a century to finds a comparable bombshell in Marilyn Monroe (the same go-to comparison of every curvaceous star since). Nobody’s writing articles about how Olivia Wilde is bringing to mind the era of Twiggy. But for those of us who find women with curves alluring, let’s raise a toast to the Bombshell of the Moment… however fleeting it may be. NOTE: This piece was originally posted on STARPULSE on April 28, 2010.